The party’s over and you’re walking home in the cold January air, barely warmed by that last drink. You fumble through your jacket pockets for your earbuds that you hastily untangle and tune into that new Buddie EP and, soon enough, you’re home. “Change of Scenery” encapsulates that familiar jaded feeling of a dissatisfied cold walk home, touching base on feelings of inadequacy, ambivalence, and spectatorship to the tune of fuzzy overdriven guitars and 90’s songwriting conventions. Philadelphia’s Buddie has been cranking out high volume bummer rock jams and their first EP, released through Boston label Super Wimpy Punch, shows promising consistency in tone and output. The band is tonally aligned with the grunge revival movement while adding their own signature high gain fuzzy walls of sound and dynamic songwriting. The EP’s opening track, “Sloth” begins with a dissonant affirmation, “I’m a sloth; run down”, followed by a quiet-yet-blown out chord reminiscent of that burnt out Marshall cab you couldn’t get repaired before the gig. The band plays with a conflation between dynamic, blown out noise and pure driven crunchy power pop riffs, keeping their songs from falling into the standard grunge formula. “Sink” romps through a very traditional verse-chorus-solo-bridge formula, playing with clean verses and big overdriven choruses, punctuating a painfully ironic hook, “oh no, I’m feeling like Toby from The Office/oh no, I’m okay.” Grungy bop “Anxty” starts with a distant jangled bass hook that sinks into a chuggy banger that wallows in, well, angst. “Change of Scenery” is a promising debut EP that is as musically dynamic as is emotionally conscious. 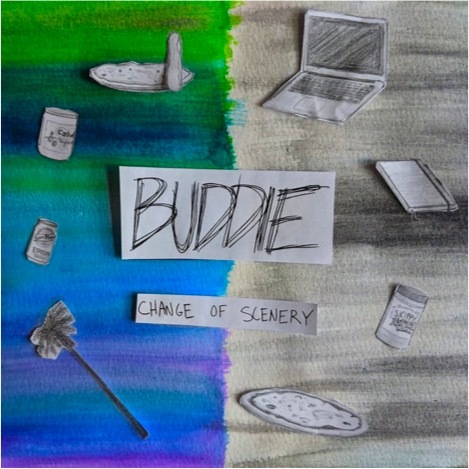 Poignant lyrics and interesting songwriting keeps Buddie’s grunge influences fresh without being totally rote, which is quite customary in a genre so enraptured with reference and nostalgia. You can listen to this album at a party, blithely talking smack with your drunk friends or walking home in the blustery winter, fuzzed out on that last PBR and Buddie’s eclectic jams.